On Sunday, Jan. 12, 2013 a Kick Off Party was held for the 2013 Henderson County Fair Queen, Catie Steck, as a send off to the 2014 Miss Illinois County Fair Queen Pageant which will be held on Jan. 16th thru the 19th in Springfield. A maidrite lunch was served and Catie worn her stunning Johnathon Kane Gown for the event. Catie also performed her speech that she has prepared for the communication portion of the Miss Illinois County Fair Queen Pageant Competition. To conclude the party the audience had a chance to do a question and answer session to help Catie practice for the pop question portion of the upcoming state pageant. Among those in attendance were past Henderson County Fair Queens, Abby Corzatt and Taylor Cupps, former Junior Miss Ashleigh Brown, 2013 Little Miss Kaylynn Hennenfent, 2013 Junior Miss Laura Newton, Fair Board President Joe Kane, Fair Board Member Curt Eisenmayer, Pastor Steve and the Methodist church family, Pageant Directors Robin Bigger and Tammy Guile, Fair supporter Art Kane and many Steck Family Members, including her proud parents Bill and Brenda Steck. Catie was especially excited that Curt Eisenmayer spent about an hour giving her a history lesson of the Henderson County Fair as well as Henderson County in general. The Miss Illinois County Fair Queen Pageant gives the local County Fair Queens a chance to promote agriculture in the state of Illinois as well as promoting their local county fairs. 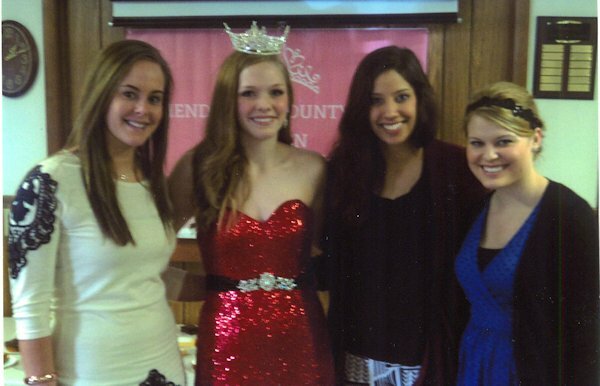 Catie has had the ability to meet other county fair queens and learn the challenges facing the county fair system throughout the state of Illinois. We are very proud to have her represent the Henderson County Fair as she is such a remarkable young woman.